A major reason why the club has been successful in hatching Atlantic salmon eggs lies in the quality of our water supply. We take it for granted but life is dependant on the quality of water we have access to. Since water is so important to us and to all forms of life, it may be worthwhile to discuss some of the properties of water. Water is unusual in that it is liquid under normal conditions. A study of other hydrides suggest that it should be a gas. Water is the only natural substance found in each of its natural states (solid, liquid, gas) on Earth. Water is called the universal solvent, dissolving many other chemical substances, such as salts, sugars, acids, alkialis, some gases and many organic substances. Oxygen dissolves in water and is essential for aquatic life. Cold water can contain more oxygen than warm water. Because water is polar, it sticks to itself (cohesion). Water has a high surface tension and insects that have to penetrate the water surface struggle to do so. This is the reason why our dry flies and the insects we are trying to imitate "float" on the water. Actually, mayflies "stand" on the surface of water. Water is also adhesive (sticks to other things) because of its polar nature. Cohesion and adhesion are responsible for capillary action which allows water to flow up plants and trees from their roots. In capillary action, water adheres to the walls of structures in plants and because of cohesion more water is drawn up. The process repeats until the gravity is strong enough to counteract the adhesive forces. This allows plant life to prosper on Earth. Click on image for bigger image As water cools it gets more dense until it reaches 4 degrees C or 39 degrees F. If cooled further, water becomes less dense. It is this reason why ice forms on top of water, rather than on the bottom. When a pond freezes over, the water at the bottom of the pond will be warmer than the water just under the ice. Otherwise ponds and lakes would be frozen solid and aquatic life would be jeopardized. Water turns to ice at 32 degrees F or 0 degrees C at normal air pressure. 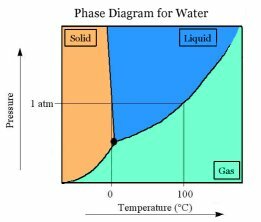 Water at normal air pressure cannot stay liquid at temperatures less than 32 degrees F. In order for ice to form, the water must lose a lot of heat. Water at 32 degrees holds twice the amount of heat as ice at the same temperature. Conversely, to melt ice, it must absorb a lot of heat. Water also has the second highest specific heat of any known chemical. The specific heat is the amount of heat per unit mass required to raise the temperature by one degree Celsius. In other words more heat is required to heat water than an equal amount of earth. When scientists talk about the oceans warming and the polar ice pack melting, think about the amount of heat required. There should be no doubt about Global Warming as an issue.